The Palmer name has been synonymous with racing in Sydney for decades, so it was only a matter of time before the family made the transition into the online realm. The Australian-owned and operated Palmerbet’s inception was back in August 2013, but the company really started hitting its straps back in 2015 when it launched a comprehensive advertising campaign hitting areas out of their Sydney comfort zone. The self-proclaimed “newest and most exciting online bookmaker” has diligently worked towards giving punters the best possible odds across racing and sport. So are Palmerbet worth investing your hard earned cash with? What can they offer Aussie punters and what makes them different from the myriad of other online bookmakers? Palmerbet have a fantastic sign up bonus for those looking to open a new account. To begin the process visit www.Palmerbet.com.au and follow the five minute sign-up prompts. Standard sign up offer: Claim a matched 100% first deposit bonus of up to $250 when using the FBBONUS promotional code. Exclusive racing promo code: Claim a 100% matched first deposit bonus up to $500 when using using the PBRACING500 promotional code. The bonus cash can only be used on racing products. Both offers require your deposit to be wagered twice on WIN bets with a dividend greater than $1.80 per $1 bet. The same rules apply for any bonus bets winnings. – Palmerbet sign up bonus wagering requirements. Palmerbet offers races from multiple countries as well as all certified domestic race meets. All the major races in the thoroughbreds, harness and greyhound markets in Australia and New Zealand are eligible to bet on all week long at Palmerbet. As well as the domestic races, punters who are looking abroad can find markets in Hong Kong, the UK, South Africa and France. Not only do they have a plethora of markets to wager upon, all the exotics exist; including quinellas and exactas, trifectas, daily doubles and quaddies. Sick of seeing a winner paying a significantly more on other totes? It is no longer a problem if you are betting at Palmerbet. Find a winner in any thoroughbred race and selected greyhound and harness races and you will get the best of the three totes as your winning dividend. Palmerbet also run a ‘first past the post’ promotion which means you’ll get a winning dividend on horses that finish the race in first position, but if the result is overturned you get to keep your winnings – and if you had the second placed horse that is declared the official winner you will get the payout. Palmerbet offer midweek and weekend promotions on the big thoroughbred meets, which means punters have a significant advantage on the opposition if they are betting at Palmerbet. One downside is the fact punters can only bet in .50 cent increments – which means if you have anything under that from a successful dividend you will need to increase it to over that amount before they can wager on an event. While the Palmer name synonymous with the horse racing industry; that does not mean they have neglected the sports side of things. Palmerbet offer an incredible amount of different sports markets to bet upon, with the options for each event growing nearly every day. Unfortunately Palmerbet do not utilise the click-to-call technology like other outlets, meaning punters that want to place a live bet have to ring through to make their investments. You can also deposit funds via direct transfer from your internet banking. Palmerbet supplies you with their account number and BSB to deposit funds. All direct transfer deposits take around 24 hours to enter your account depending on when your deposit is made, but can be a great way to deposit larger sums. Minimum deposit amounts vary but usually they are set at $10. Palmerbet has a minimum withdrawal amount of $5. Your funds can be withdrawn via electronic funds transfer and will appear in your nominated Australian bank or credit union account within 48 hours. 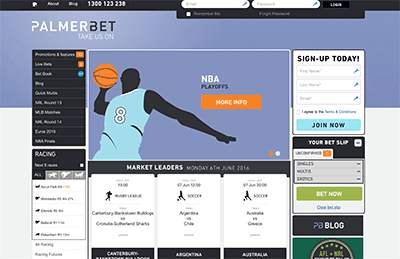 Palmerbet is easy to access via your desktop or laptop; the layout is easy on the eye and the website is very easy to navigate. On a mobile phone the access in which punters can navigate the site is just as easy, but as of May 2016, there is only an Apple app. While Android users do not yet have an app to utilise, the mobile website works in much the same way as the app, just loads slightly slower. Although they have not been in the marketplace compared to some of the other online bookmakers, Palmerbet has made a concerted effort to get themselves alongside their rivals. While there are a few nit picking issues such as the inability to make click-to-call bets or the the fact that you can only bet in .50 cent increments, Palmerbet’s efforts to get to the top of the online bookmaking world have been fruitful. We like what we see from Palmerbet and anyone looking to open a new online betting account will not be let down.